Previously, on MinerBumping... Agents Minx Mattel and Lewak found themselves engaged in a spirited debate about highsec politics with Liu Yifei, a miner who demanded to know why his friend had been ganked. Liu wanted the satisfaction of knowing he'd won a debate against the New Order--but our Agents were playing for keeps. Minx and Lewak wanted to sell Liu a permit. Unfortunately, the miner had nothing but contempt for the Code and those who enforced it. Needless to say, our Agents weren't working with fertile soil here. Despite being a highsec miner--or perhaps because of it--Liu was extraordinarily arrogant and stubborn. You'd think mining Veldspar for ten years would teach this guy some humility. As always, the name of the Saviour of Highsec worked miracles. Liu allowed himself to blunder into a humiliating trap of his own making. Now Liu had to admit that he was wrong about something. It was the first crack in his carefully constructed persona. Our Agents did not hesitate to take advantage of it. Attempting to mock the Saviour of Highsec proved costly; the haughty miner's confidence would never fully recover. The instant karma was further evidence of the Code's power. Still, our Agents were a long way from selling Liu a mining permit. The miner could sense that he was on the defensive now. Even so, he felt that his résumé offered him some protection. Liu quickly scurried behind it and used it as a shield. Would it hold? Once again, the miner was shattered. Liu's missteps and tactical withdrawals were developing into a full-scale rout. As Liu ran for cover, our Agents advanced. It seemed as though there was only one way this debate could end: Total victory for the New Order. Only a miracle would save Liu now. No, the miner would not be saved by a plot twist. His last hope swatted away by our Agents, Liu's focus rapidly disintegrated. He was going to lose this debate, but would someone like Liu ever actually submit to the Code's authority and buy a mining permit? A rebel's rejection of the Code can be compared to a mental illness. And as with other illnesses, sometimes, just at the moment when all hope seems lost... the fever breaks. Liu had been intellectually dominated by the two Agents. He'd tried anything and everything he could think of to argue his way out of the Code's truth. There was no escape, though. He had to admit that much. Miners should know when they're conquered. In this case, the miner did. 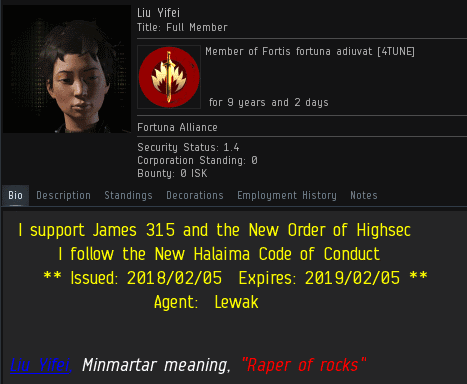 Liu ended up purchasing 60 million isk worth of mining permits. The New Order prevails on battlefields of all kinds; our Agents are masters of both rhetorical and spaceship combat. It's elite PvP, but it's not really a fair fight. They are armed with the Code. And the CODE always wins. Always! I am the only one annoyed by the typo in his bio? and antiganking fail the playerbase AGAIN. Meh, what do you expect from criminals? Those are the same people who followed and emulated shardani. Shitters, the lot of 'em. He should be ganked again if that's not fixed soon. And, I have a hard time believing that shitter is a cop, security guard maybe. Nope, I believe these hothead shitters are all juveniles. I mean, I don't know any adults that act like that, but I do come from an exclusive area where people are a bit more refined. We pay our cops to keep out rubbish, not act like it. It's good to be selective. Im still waiting for screenshots of the dog actually dying when you autopiloted. The miner knows who he is." That demands a story dammit!!! Why you leave me hanging yesterday? Ohh the teamspeak autopiloter that Trump ganked. Sought ship replacement and his wxcuse for breaking the CODE. was his dog was strangling itself and dying on the fencepost. I asked for evidence and he went bezerk. He is still chuckin a shardani. Lol, fukin carebear's default setting is "lie". Useless shitters. A million ISK says he never actually read The Code and he'll provide the material for Part 3, as soon as a miner under his wing slips. I raise your wager to a billion. Well written post, in this post you are moving a very important problem. CCP has all the server logs, surely they can tell what the client is doing. Filing a report is not a judge, jury, executioner scenario. It's merely a request for investigation. CCP looks in to it and if they feel that the EULA has been violated, they act. It's actually quite interesting how the vigilantism that mittens hates is the same kind of vigilante behavior that CODE engages in. By not reporting potential bots to CCP and instead ganking them, how many bots are CODE allowing to continue existing in New Eden? CCP has asked the player base to help them identify bots by reporting instances of this behavior. When they ask for your help and you refuse it, can you really be mad that they havent fixed the problem. The player is the first line of defense against botting and you should report every potential bot you find to CCP for evaluation.